Our LOVE YOUR YOGA Flash Sale is back!! Last year we offered special pricing to help you stay motivated - whether you’re new to yoga and just starting to make yoga a part of your life or you’re a lifelong practitioner - we’re here to support you! Our Flash Sale will run from now through Feb 11th - you’ll want to jump on these deals as we won’t be offering another deal until summer. 5 CLASSES FOR $59 (Regularly $70) - this pass expires 90-days from date of first use. If you’re only able to drop in from time-to-time and need the flexibility, this is your package! Limit 2 per student. 10 CLASSES FOR $99 (Regularly $120) - this pass expires 90-days from date of first use. If you’re a more frequent flyer but need the flexibility, you’ll want to choose this package. Limit 2 per student. UNLIMITED YOGA MEMBERSHIP $79/monthly autopay (Regularly $99/mo) - this option offers you UNLIMITED YOGA CLASSES, 1 guest pass, and discounts on workshops and special events EVERY MONTH. If you’re attending classes 2-3 times a week or want to really commit to your yoga practice, this is the best bang for your buck! We ask for a minimum 3 month commitment with 30 day notice when you’re ready to cancel. This special pricing is available now through February 11th - don’t miss out!! 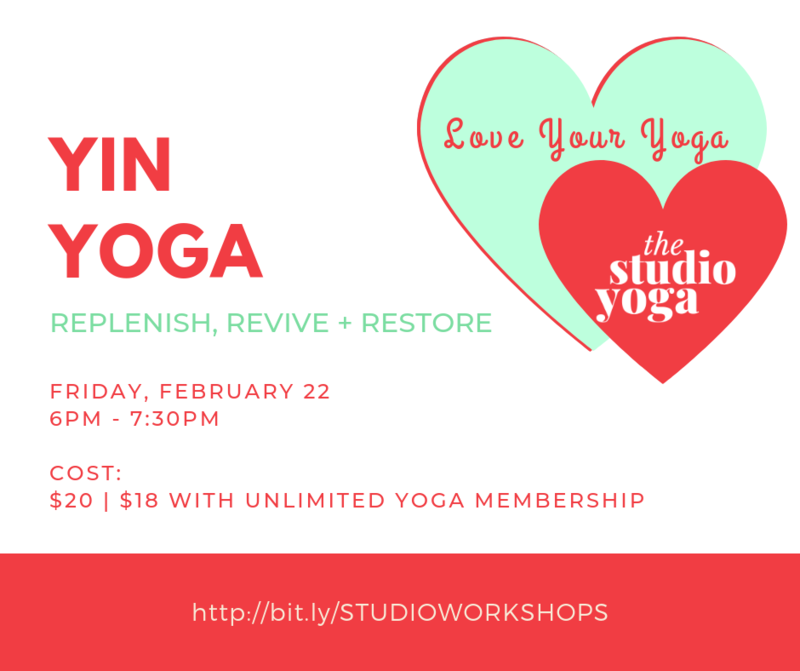 This February we are offering a variety of special events to help you “Fall Back In Love With Your Yoga” - we hope you’ll join us! If you’re an UNLIMITED YOGA MEMBER, we’re offering a discount for each workshop. If you’re not an UNLIMITED YOGA MEMBER yet, now’s the time to upgrade! Uncover the physical and mental signs of blocked energy in our fourth chakra ("Anahata") and learn how to use the tools of yoga to tap into our heart's center for a loving, compassionate approach to life. Join us for this 90minute deep dive into the heart chakra using asana, sound and visualization. This is a beginner-friendly practice. Class size is limited to 12 students. Pre-registration required. "You cannot pour from an empty cup"
Join us for 2 luxurious hours of guided self-massage using foam rollers and a variety of therapy balls. Learn to unwind, release tension in the tissues and reduce stress for a greater sense of well-being. All props/tools provided for use during class. Class size is limited to 6 students. Pre-registration required. Yin Yoga is a slow, meditative practice of holding seated and supine poses in stillness for up to 10 minutes. Yin Yoga targets our connective tissues - ligaments and fascia - vs. the muscle and is the perfect compliment to more dynamic forms of yoga. Yin promotes deep release and relaxation. Join us on this inner journey, cultivating mindfulness, an awareness of internal responses and the fluctuations of the mind. This is beginner-friendly practice - Perfect for a "Date Night"! Class size limited to 12 students. Pre-registration required. In this special 4-week series, the Instructor will work with you to build a foundation for your yoga practice. This course will cover the basic poses in-depth, working with you and your body to make sure that you're getting the most out of your movement. You will also learn the basics of understanding yoga - how the breath works, fundamentals of focus, and how yoga can positively affect your life. This 4-week series is limited to 12 students. Pre-registration is required. $39 for 4-week series; option to add a 5-class package for $39 to supplement your beginning yoga practice.